At Richmond Art Center, 2540 Barrett Ave, Richmond, CA. My art quilt "They Know Which Way to Go" is included in this show and you can also see it here. Friendly Writing for the Visual Thinker is the workshop I will be teaching at the San Francisco Center for the Book on Sunday, August 26, 2018, 10am to 4pm. Beginners warmly welcome! We will first create a writing notebook and then continue with writing explorations. $130.00 (all materials included). The August workshop is listed at SFCB here. At San Jose Museum of Quilts and Textiles. 520 S. First Street, San Jose, CA. My art quilt "Hand Gun" is included in this show and you can also see it here. Details, slide show, and catalogue info is here. Makers, looking for a fresh process? A new angle? A way to access content? A hike through the imagination, a careful notice of the physical world, a dedicated path to the content store within you, Creative Arts Process Cards can inspire your next project. The cards encourage you to engage deeply, work slowly, providing an impulse and the freedom to make a project of your own. A great little gift. For more information and to order your own Creative Arts Process Cards deck read more here. Art Quilts/Open Books is a new page devoted to my current fiber art projects that incorporate layers of text, color, texture, and imagery. Support Living Artists! (as Susan King once said) Full description of available books and images: nevermindtheart. See what blocked the lanes on the freeways in the SF East Bay for a few years and read a short memoir in Diagram: Issue 14.6, published Dec. 31, 2014; The combined scrolling list/story is called "Traffic Matter." Read more stories and poems by Alisa Golden in these literary publications. The little but mighty print zine Blink-Ink has accepted my work in the past couple years, publishing my 50-word stories in #29, #26, and #25. Consider supporting a small press and subscribing for only $12! Vegetarian Comfort Food and Cats contains one hundred favorite recipes from bread and muffins, cakes and pies, casseroles, sides, and main dishes to cookies and bars, pancakes, salads, and soups and stews. Vegan and gluten-free options are offered and noted. Included are photos of neighborhood cats, highlighting the kittens who grew up next door. Originally created in 2008 for my daughter, this is the expanded and retested version of recipes that are continually requested at my house. You an find a copy of Vegetarian Comfort Food and Cats at Amazon. Spring 6.1 is now available! Hear our voices! Support the project and get a print copy of 6.1. Follow news and comments for *82 Review on Facebook! I supplement the structures book with thoughts on the creative process, creative writing, reading, exploratory essays on writer/artists and exhibitions, and I include a craft project here and there. See makinghandmadebooks.blogspot.com. 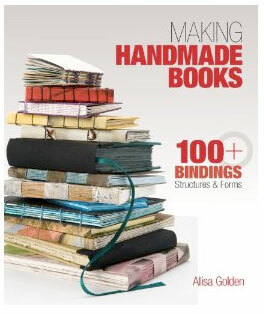 Making Handmade Books: 100 Bindings, Structures and Forms is my fifth instructional book, a compilation and revision of the first three books plus new material, 16 or so new structures, and 41 statements from professional artists who make books and/or teach bookmaking. You may purchase books directly from the press via cash, money order, or check. Select books and art are available via credit card at my Etsy store: nevermindtheart. Photos of the books here. Catalogue and preview of catalogue available here. Photos of the exhibit here. Catalogue may be purchased from CreateSpace or from Amazon here: PrintWorks: CCA Faculty and Alumni. In Summer 2007, my interviews and article for the Pacific Center for the Book Arts journal The Ampersand was published. Tsang Kinwah and Heejung Kim have posted the article on their websites. Sangmi Chun has posted excerpts on her blog. I'm happy to report that I've now got it online with active links so you can see all the artists and artwork easily. The following people graciously gave their time: Xu Bing, Michael Cherney, Elsie Sampson, Tsang Kinwah, Kahoru Otani, Veronika Schäpers, Seiko Tachibana, Peng-Peng Wang, Shu-Ju Wang, Narae Kim, Sangmi Chun, and Heejung Kim. Thanks to everyone who had input. Hard copies of the magazine are available through PCBA. 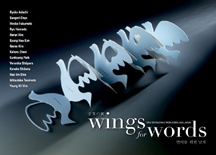 The article became a prelude for the Wings for Words exhibit at the San Francisco Center for the Book in 2009. Here is an article "The Background's The Thing" that I wrote in September 2008 for the Pacific Center for the Book Arts Journal The Ampersand, comparing book art to science fiction short-short stories from the 1960s. My friend and colleague, Lisa Kokin had an exhibition at the Donna Seager Gallery called Panacea Plus. I was honored to be asked to write the essay for her catalogue. The full-color catalogue is available (with the introductory essay) from lulu here. You can see a video of her discussing and showing her work here. © 2005-2018 Alisa Golden. All rights reserved.